Label removable totes and containers? Why, of course! FOX IV’s label printer applicators and label applicators can label your reusable tote or container easily. Tote labeling systems can be used for order specific labels such as “license plate” labels, contents labels, warning labels, routing labels or shipping labels. When used with removable or dissolvable label stock, you truly have a cleaner, reusable container without the mess of half-peeled labels. The labeling system can be integrated into your production line to recieve order specific information to be printed and applied to the tote. FOX IV can supply all of the scanners, verifiers and software interfacing necessary to provide a complete tote labeling system. We can even provide a turnkey system complete with conveyor and ready to slide into your production line. 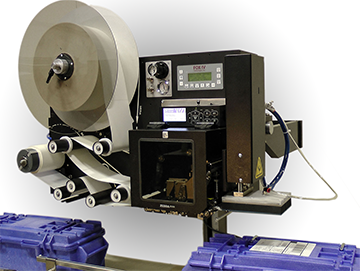 FOX IV’s 4″ wide print and apply units are most commonly used for tote labeling; however, the size and model of the print and apply unit or label applicator are dependent on your individual labeling requirements. 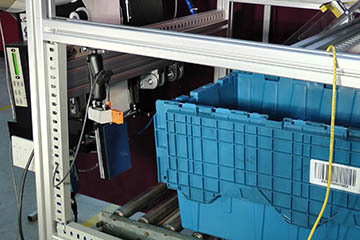 Options for tote labeling systems include: mounting stands or bracketry, scanners, encoders, verifiers, enclosures, warning/safety devices, material handling and integration services.